This is a story about an unsung Southern fried chicken chain, and it begins with love. Actually, I should say it begins with a place called Love’s, and my own deep-fried feelings for Chester's, a fried chicken restaurant that may not sound familiar — and let's be clear: it's not the best fried chicken you'll find on the road — but has given me much comfort along life's travels. I didn't realize it when I was younger, but I kind of grew up on gas station fried chicken. There are several places where drivers can fill up on both gas and grease-fried bird between my hometown of Huntsville, Alabama, and Atlanta, where I live today. I have lots of family between the two cities, in Alabama towns like Bridgeport and Scottsboro (home of the world-famous Unclaimed Baggage), and Tennessee towns from Nashville to Chattanooga. 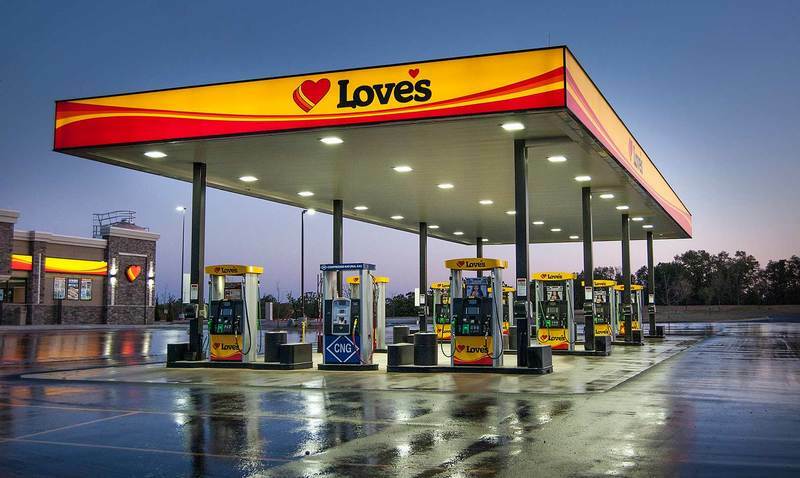 When I was a kid, my mother or any other relative shuffling my cousins and me from one town to another would stop at Love's for gas, and if they had fresh fried chicken under the heat lamps behind the glass display, we'd get enough to eat in the car to hold us over until we arrived at our destination. You can find Love’s Travel Shops all around the South. The sprawling tractor-trailer fill-up stations are known for having noticeably cheaper gasoline than other fuel stops, particularly along interstates like I-24, I-20 and I-75. Love's is also very random, even for a truck stop. It operates like a gas station, but also a sporting goods convenience store, a temporary place for the road-weary to rest and even shower, and a no-frills fast-food hall for travelers, with restaurants ranging from McDonald's to Godfather's Pizza. When you see the towering, undeniably happy yellow sign with its orange hearts horizontally stacked next to the brand name and the friendly, ‘70s-style font that uses a tiny heart for an apostrophe, you'll know you’ve found it. 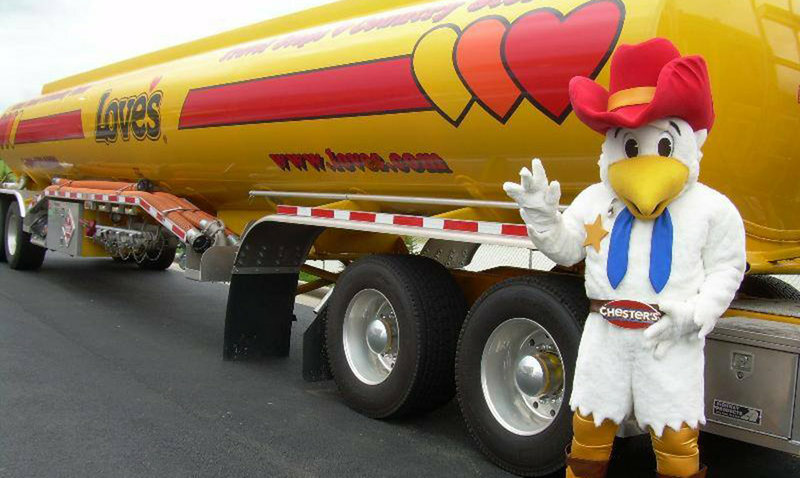 And when you find Love's, be sure to look for the white-lettered logo for Chester's and the image of Chester the Chick, the anthropomorphic chicken mascot featured on the brand's logo. Then you'll know you have arrived at a place I trust for fried chicken on-the-go. As far as chicken mascots are concerned, I trust The Colonel, I trust the cows, and I trust Chester the Chick. He wears a red cowboy hat; a blue bandana around his neck; big, friendly eyes; and a smiling expression coming from his beak. Something about that chicken’s demeanor just feels right. The bright eyes, the smile, the all-American color scheme of his outfit, and the care that was taken to make sure his image was modernized — everything about him suggests that he has it all under control, and as long as I can find him, I can get enough fried chicken, seasoned potato wedges and barbecue sauce to get me over the inevitable road trip hump. Sometimes Chester the Chick is printed on nylon flags outside the building; other times he is cast in plastic above the door. In his original 1965 rendition, according to the company's website, he wore a holstered gun, which over the years was replaced with a plain brown belt. Chester's earned my trust because of this logo. He seems believable for some reason I haven't figured out yet, other than that he's drawn very carefully. Besides, I’m not here to question Chester the Chick's style or need to bear arms (He also wears a sheriff’s badge); I’m here for his crispy poultry deliciousness. Fast food may be losing ground to other restaurant formats, but highway food is all the rage these days. The Atlanta Food & Wine Festival’s 2017 programming included “gas station cuisine” as a topical experience. 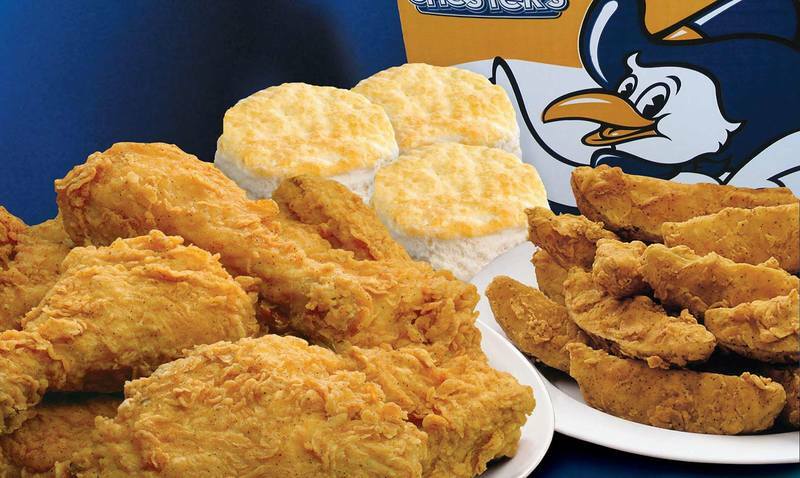 Thrillist recently named Krispy Krunchy Chicken the best fried chicken chain in America. Food TV shows often have their hosts make unannounced pit stops at random shack-like places along their cross-country travels. There’s something innately American about getting food and gas for your vehicle in the same place, somewhere off the interstate in the small-town South. And Chester's is more successful than you might realize. The 50-year-old Birmingham-based company switched from licensing its name to a franchising model in 2004, which is probably why I don't remember seeing the sign back in the '80s. Today, under the leadership of founder W.O. Giles' son Ted, it has grown to more than 1,700 locations at gas stations, colleges, airports and supermarkets across the country. They're obviously doing something right. Let me be clear: Chester’s is not the best fried chicken you’ll find on the road. We established that recently in a Southern Kitchen taste-test. Its double-battered main menu item definitely gets the job done, but it is neither particularly noteworthy or memorable in terms of spices, seasoning or flavor. It's just keeping it real. Are they competing with beloved Southern chicken chains like Popeye's, in terms of taste? Probably not. But that may not matter, or at least isn't the main objective to eat there. 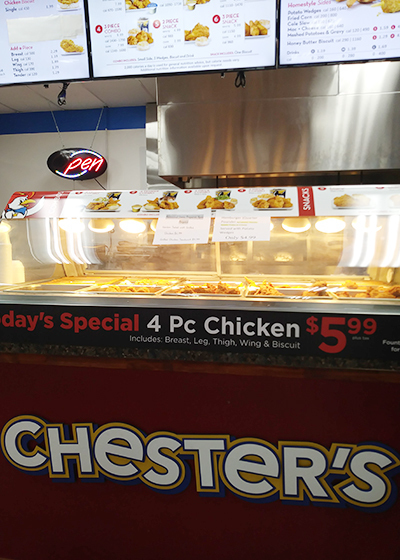 For what Chester's lacks in comparison to other fried chicken businesses, it makes up for in reliability. The restaurant also cares enough to have a logo design and mascot that looks believable for a fried chicken franchise, and I'm a sucker for above-average fried chicken and a nice design. Fried chicken doesn’t have to be perfect. It just needs to be consistent, even if it requires the addition of a signature dipping sauce. 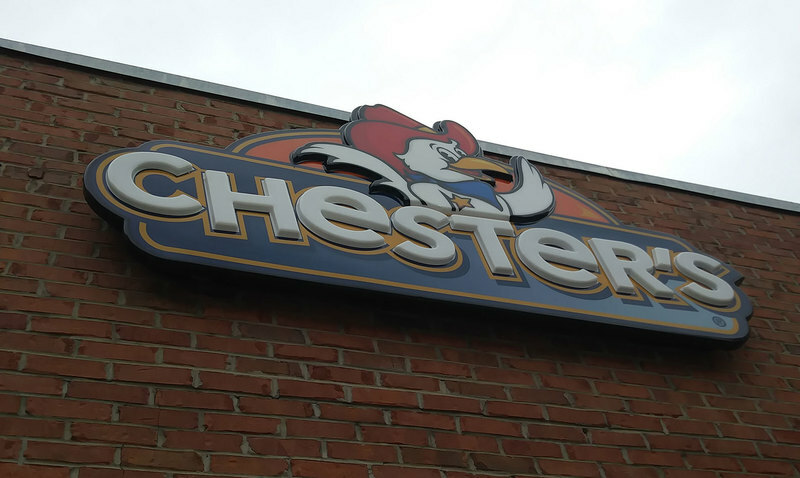 As long as Chester's can consistently be there to comfort my soul on the highway of life when I didn't even know I wanted or needed fried chicken, along with a friendly, believable chicken mascot, that’s good enough for me.